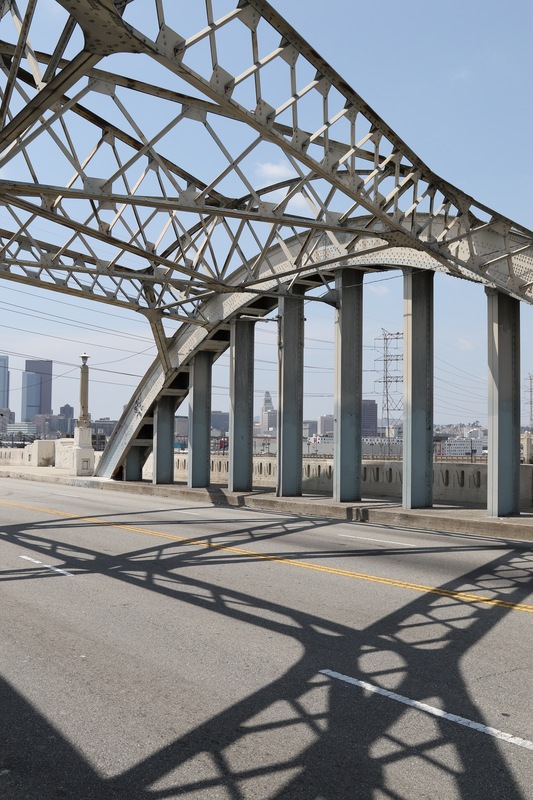 LA River bridges tour, part 3 | ride. travel. live. The Sixth Street Viaduct (1932) celebrated its 83rd and last birthday in 2015. The bridge is scheduled to close on January 3, 2016, and demolition will start five days after that. So after being on life support for years, and deteriorating from within, it’s going to be replaced. I walked it on a day where it was closed to traffic for a film shoot, so it was possible to get a close look without dealing with traffic. The bridge attracts a large number of filmers, photographers, fashion shoots, car rallies below, and in a way, it’s the town square of the Arts District. And on occasion, a few people climb up to the top of the bridge for what must be a pretty, and illegal vantage point. East entrance, Art Deco flair, now sadly deteriorated. The bridge has seen much better days, and from old Los Angeles Times photographs, it was clear that the cracks were appearing very soon after its opening. Now the railings are crumbling, the anchorages are separating, and it’s literally falling apart. In certain places it’s possible to see the river below the cracks in the structure. It’s still the most graceful of the spans across the river, immediately recognizable from the theatrical double arches mixed with restrained Art Deco flourishes. Really worth a look is the area around the tunnel leading to the river, which feels like a cathedral if you use your imagination a little. Also look for the patched up sections where engineers tried to slow down the alkali silica reaction that ultimately led to the bridge’s demise. 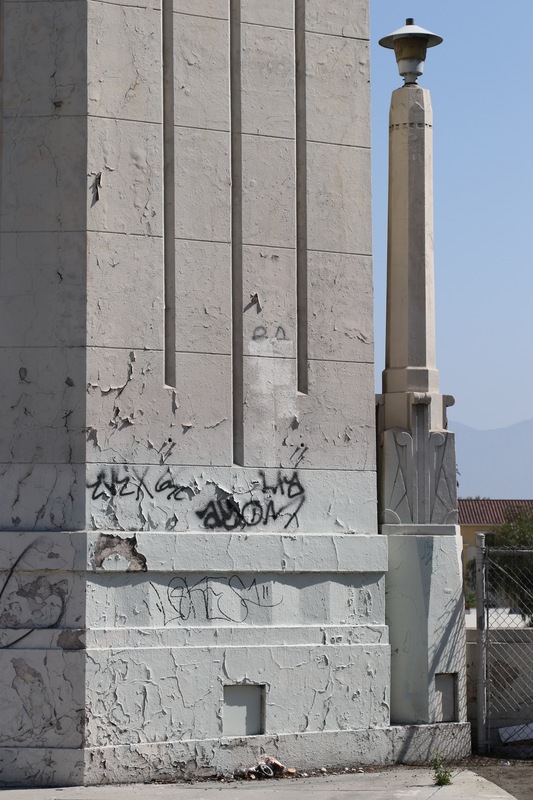 The fading LA icon, Sixth Street Bridge. This doesn’t really give you a secure feeling, it’s probably a 4-5 inch space in there with a view of the river channel below. I stopped briefly for some coffee on Mateo Street, which seems to be the epicenter of the Arts District these days, once creepy, now uber-trendy and busy with pedestrian traffic. And then it was on to the 7th Street Bridge, a much less spectacular structure from the roadway. 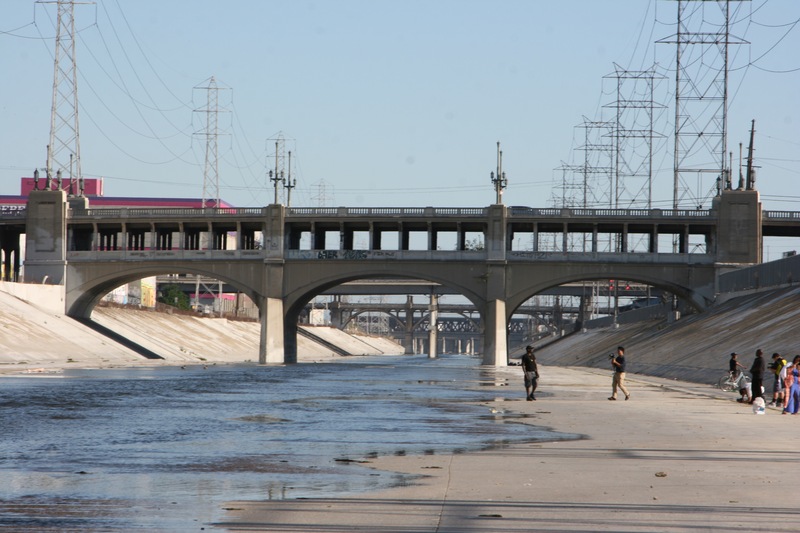 This bridge links LA’s once-thriving downtown retail corridor 7th Street with Boyle Heights. What’s interesting about this bridge is that it was constructed in two phases. The lower deck came first (1910), and as the traffic demands increased, a second upper deck (1927) was built and the lower one abandoned. The lower level is now barely accessible, gated off, and is a roof for numerous homeless residents of the city. The bridge is better viewed from the river (walk through the 6th Street Bridge access tunnel and turn south), where the engineering behind it is clear. 7th Street Bridge, two parts built 17 years apart, but looking pretty cohesive overall. Then it was uphill, as 7th Street passes under numerous freeway lanes, climbs steeply, and meets a traffic light at Boyle Avenue at the crest. My walk came to an end at the landmark Sears on Olympic Boulevard, which is now pretty empty save for a small retail section that somehow hangs on. It’s a time warp building that’s preserved the old signage and neon. Pretty much my feet were battered from 11 miles of walking on the rough surfaces, especially the last section that crossed over the very large, complicated 5 / 60 / 10 interchange. Next part in this series, the bridges south of I-10, Olympic Boulevard Bridge and Washington Boulevard Bridge. I walked these on two separate occasions, and they’re unique, rarely explored places hidden among the warehouses, grime, and heavy truck traffic. Stay tuned.